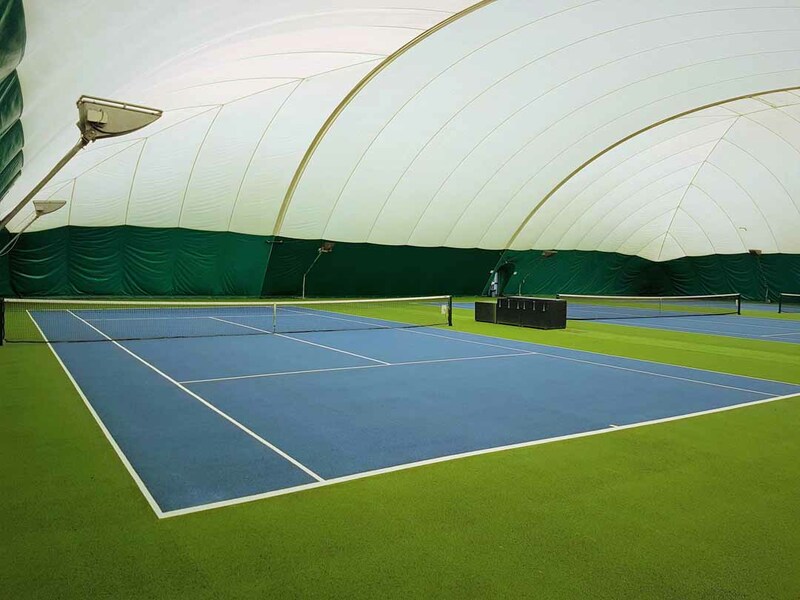 ► Our three indoor courts are housed in "The Dome". ► The Dome is an excellent facility enabling play whatever the weather or light conditions outside. ► The Dome is used most during the winter when the days are shorter and weather is generally poorer. ► That said, The Dome is used throughout the year given our unpredictable weather whatever the season! ► Like all our courts, courts in The Dome can be booked and used from 9am-10pm. The use of our outdoor courts is included in the annual membership fee. ● Can book the courts using our online system, up to 7 days in advance. ● Purchase the Silver Membership option paying an annual fee for all indoor court use. Non-members can only use the outdoor courts when accompanied by a member. ● An non-member can make a maximum of 6 visits per year. ● A member of the club must be available to provide access and take payment. To check availability and make a booking non-members should call 07948 372611. ● Peak times are Monday to Friday after 6pm and all day Saturday. ● Off-peak times are Monday to Friday before 6pm and all day Sunday. ● Bookings can be cancelled up to 24 hours before usage time with no charge. ● For bookings cancelled within 24 hours of the court time the full fee is payable. ► Email us at the address shown on the contacts page. Follow the quick link by clicking here. ► Pop in - there's usually someone around at the club from about 9:30 so if you're passing please do pop in to see us.